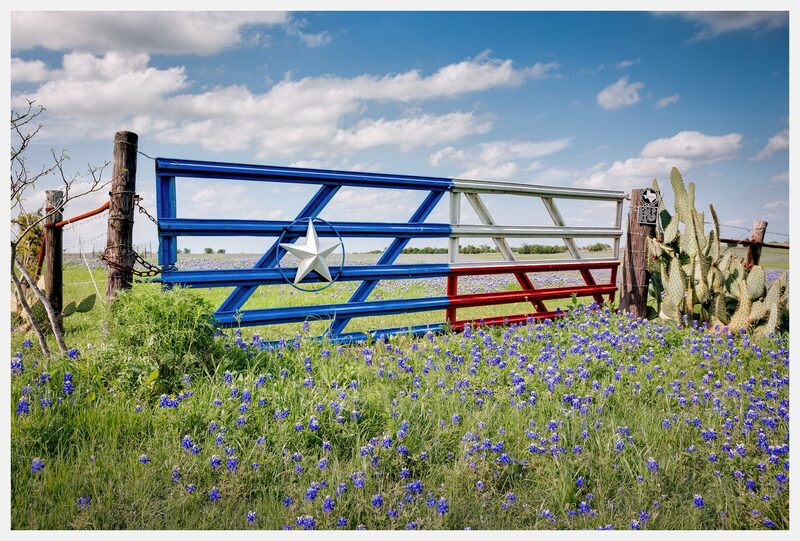 "Lone Star Gate with Bluebonnets" - Considered to be the Bluebonnet Capital of North Texas, this picturesque scene is located in Ennis, Texas - a southeastern suburb of Dallas, Texas. Every April, bluebonnets attract thousands of visitors from across the state. As historian Jack Maguire so aptly wrote, "It's not only the state flower but also a kind of floral trademark almost as well known to outsiders as cowboy boots and the Stetson hat." He goes on to affirm that "The bluebonnet is to Texas what the shamrock is to Ireland, the cherry blossom to Japan, the lily to France, the rose to England and the tulip to Holland."